Note: where the text says “image” we are still sourcing the original images. The Ven. Sayadaw speaks of himself as a fisherman casting the golden net of Buddha Dhamma in many far off seas. Now, en route to Australia before returning to Burma, after nearly a year and six countries later, one can begin to see the outlines of that compassionate net. Six new pagodas have been built at new gathering sites. Many beings have met the Ven. Dat Pon Zon Sayadaw and their commitment has grown. 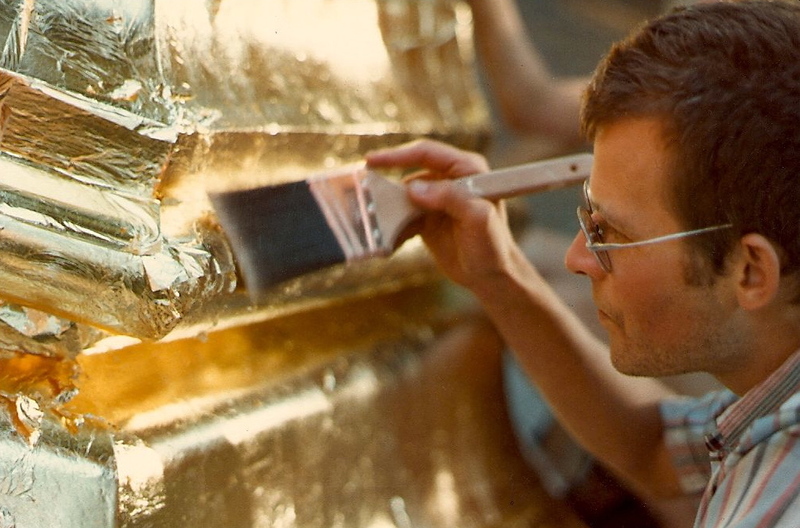 From this commitment, inside each one, the precious elements will be slowly gathered and the impurities will be transmuted into gold. After repeated requests, the Ven. Sayadaw has agreed to share this short biography with the noble wish that it may be of help to beings on the Path. To Ashin Thitzana, U Sai Hark, Daw Nunu Khin, Dr. P. Raj and family of Sydney, David Pooch, Royal Abbot, Ken Eades, Erica Gorman, John Jackson, Susan O’Meara and Pat Valient must go the appreciation for helping to produce this book. The Ven. Sayadaw U Thila Wunta was born on the 28th of June, 1912 at 10:15 a.m. local time at Wekalaung Village, Mon State in Burma, 98 degrees East and 15 degrees North. The Ven. Sayadaw’s auspicious birth date was on the full moon of Vassa, the first day of the beginning of the three-month retreat undertaken by all monks in the Buddhist Order. His parents were U Ngyein and Daw Tint and his grandparents, U Nyu and Daw Poe, were the donators of the local monastery. The name chosen for the Ven. Sayadaw was Botaya, which means “one who loves dhamma”. The Ven. Sayadaw lived with his grandparents until May, 1919 when he began his schooling at the monastery school. In 1927, the Ven. Sayadaw became a novice monk and was given the name U Thila Wunta, which means “one who has great sila (great morality)”. In May, 1932, on the eleventh waxing of the moon in the year 1294 of the Burmese calendar, the Ven. Sayadaw was ordained as a bhikku in the Wekalaung Village Monastery under the preceptorship of the Kyaw Village Sayadaw with 40 years in the Buddhist Order. The first recitation of the Kammavaca was by the Ven. Ankhe Sayadaw with 32 years of monkhood. The second Kammavaca was by the Ven. Sayadaw of Kawli Village with 22 years of monkhood. The third recitation of the Kammavaca was by the Ven. Htin-Shu Sayadaw with 16 years of monkhood. There were 15 monks in attendance. The Ven. Sayadaw spent his first three-month retreat period at the Htan-bin Monastery in Wekalung Village. In 1933 at the Ankhe Monastery he completed his first year of studies, and after six months more in Ankhe continued his studies in Bilugyn Island near Moulmein at the Teik Kyaung Monaster until 1938. At that time he studied under the supervision of the Ven. Sayadaw U Nayada of Payagyi Monastery, the Ven. Sayadaw U Ariya of Ahlei Taik Monastery and the Ven. Sayadaw U Pyin Nyein Da of Aung Mye Bonzan Monaster, all in Mandelay. Due to the unrest created by the Indo-Burmese riots, the Ven. Sayadaw returned to Rangoon in 1941. The Ven. Sayadaw constructed his first pagoda on the second level of the 2,500-year-old Shwe Dagon Pagoda in Rangoon. The consecration ceremony was held on the full moon of November, a Sunday, in 1941. This pagoda was consecrated as the Su-taung-pye Kat-Kyaw Pagoda, which means “the pagoda of good wishes which overcomes all disasters”. It is know today as a miniature Shwe Dagon. Mr. White, one of the Sayadaw’s meditating cats. On December 23, 1941, the Ven. Sayada, after witnessing reconnaissance flights by the Japanese over the city of Rangoon, decided to walk to Pegu, 50 miles away. After completing an intensive 23-day meditation commitment in Pegu at the Shwe-gu-gyi Pagoda the Sayadaw took a train going to Moulmein. At Zin-kyaik, by a stroke of fortune, he left the train which was later bombed by the Japanese at Martaban before reaching Moulmein. The Ven. Sayadaw, having escaped the bombing, continued on foot and rested between Panga Village and Ka-Ruppi Village. During this time the Japanese invaded Burma and the British retreated. In 1942 the Ven. Sayadaw returned on foot to Rangoon from Moulmein with a group of monks, but found that the situation in Rangoon during the war was not conducive to meditation practice. So he walked back to Moulmein. 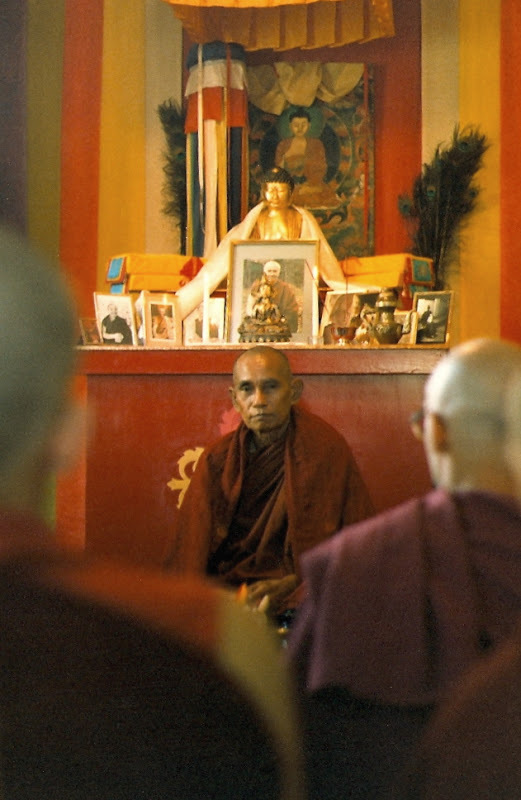 He resided at Phaouk Monastery in Mon State during the war for four years and continued his practice there until the overthrow of the Japanese regime. 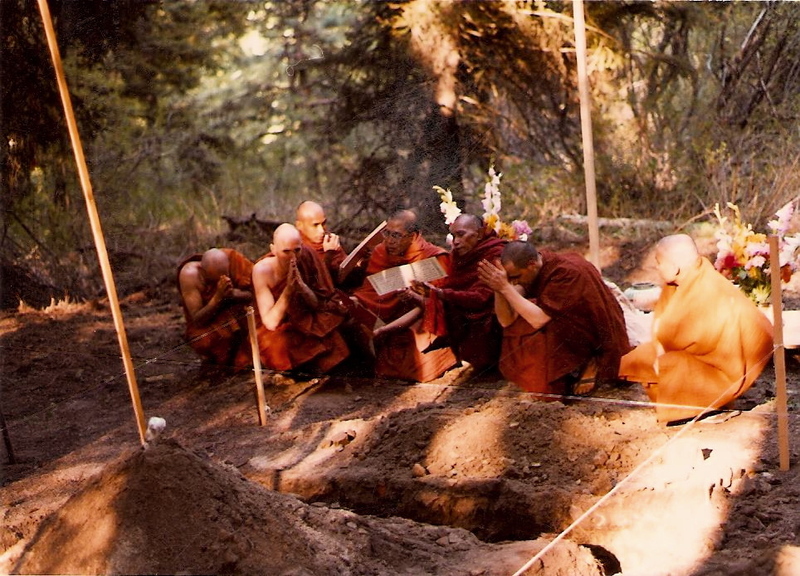 He practiced peacefully under the shade of dhamma despite the suffering and turmoil of war. Dat Pon on Aung Min Gaung Pagoda. In early May, 1946, the Ven. Sayadaw returned to Ragoon and accepted his first small meditation hut from Barrister U Khin Mg and his wife Daw Khin Than, sister Daw Khin Aye and Ma Bi Bi, U Ba and wife and Daw Phaw May and family. He spent that rainy season lent retreat in the bamboo hut with the Ven. Ya The Taung Sayadaw, Ven. 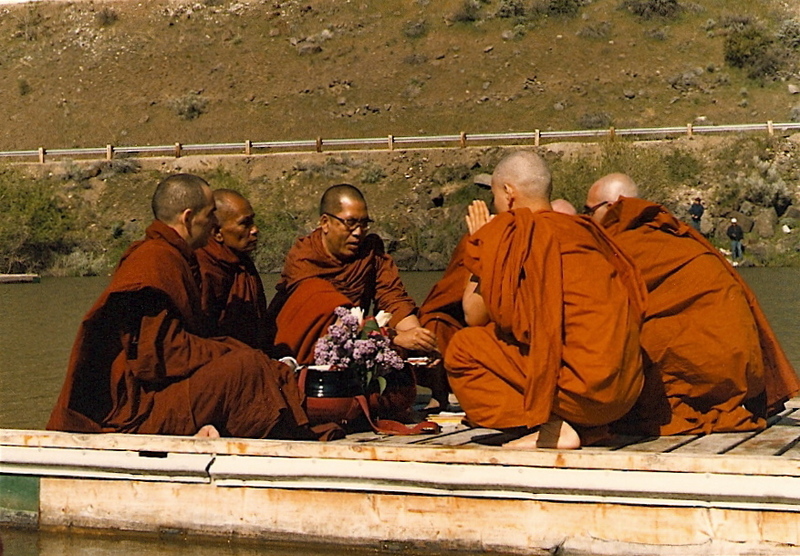 Taung Gyi Sayadaw and three other monks. The Ven. Sayadaw was given and accepted another bamboo hut from Dr. Ba Yin which was located in the forests behind the Shwe Dagon Pagoda on Lowis Road in Golden Valley. In May, 1947 the Ven. Sayadaw received another small mediation hut from the people living in Kapili Kwathi on the west side of the Shwe Dagon Pagoda and, along with eight other monks, spent the rainy season retreat period there. By sharing the power of living kindness and the merit of practicing the Teaching of the Buddha with lay disciples, may obstructions both to their bodies and minds were overcome. In November, 1947, the Ven. Sayadaw arrived in Mandalay to meditate at the Mahamyatmuni Pagoda. There he engaged in many interesting conversations with a student of the Bodaw Aung Min Gaung. They talked about different types of meditation and the accomplishments of this great yogi. During this discussion the Ven. Sayadaw learned that this student had travelled the distance between Popa and Mandalay – normally a two-day journey – in just three hours. On November 21, the Ven. Sayadaw went to Popa and met the great Bodaw Aung Min Gaung himself. He began and intensive retreat session, asking the Bodaw to explain the nimittas (signs) which had arisen in his meditation. The Bodaw promised to help in all the works of the Sayadaw, strengthening the Buddha Sasana in Burma and abroad. The Ven. Sayadaw then journeyed to Pagan, Nyaung U, Chauk, Yennaung Chaung – all the towns in central Burma. He then visited Shwesandaw Pagoda in Prome before returning to Rangoon in late January, 1948. 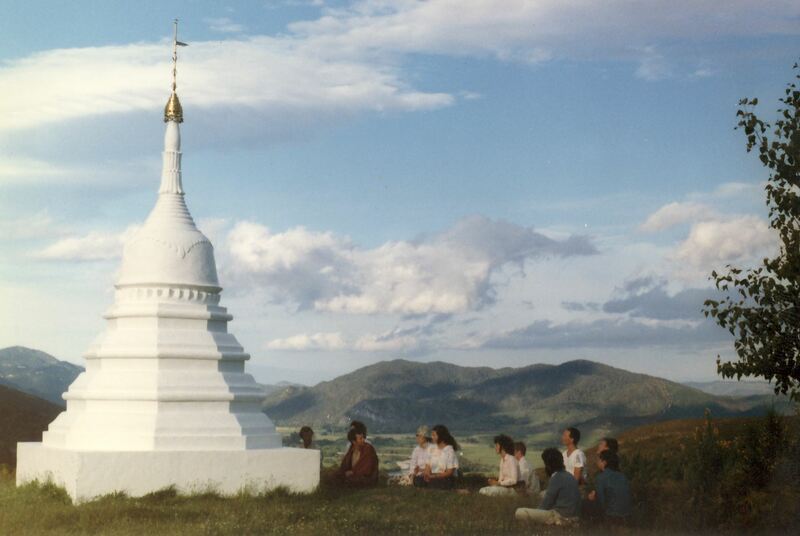 He then began an intensive meditation practice in Kyaikthiyo Pagoda in Mon State. After completion, the Ven. Sayadaw visisted Kay-Latha Pagoda, Myathabeik Pagoda, Kyaktaung Pagoda, Kyaukmara pagoda and the Ahlaungdaw Kathapa Pagoda. On the mountain surrounding the Ahlaungdaw Kathapa Pagoda one most observe the five moral precepts: not taking the life of another, not taking that which is not given, not misusing sexual energy, not engaging in wrong speech, and not taking substances which intoxicate the mind. Also, while meditating on this mountain, it was important that one eat vegetarian food only. There have been instances where a person disregarded the precepts or ate meat, at which time disaster struck them; a tiger attacked them, a sudden sickness, a fall at times causing death, but always forcing them to leave the mountain. The Ven. 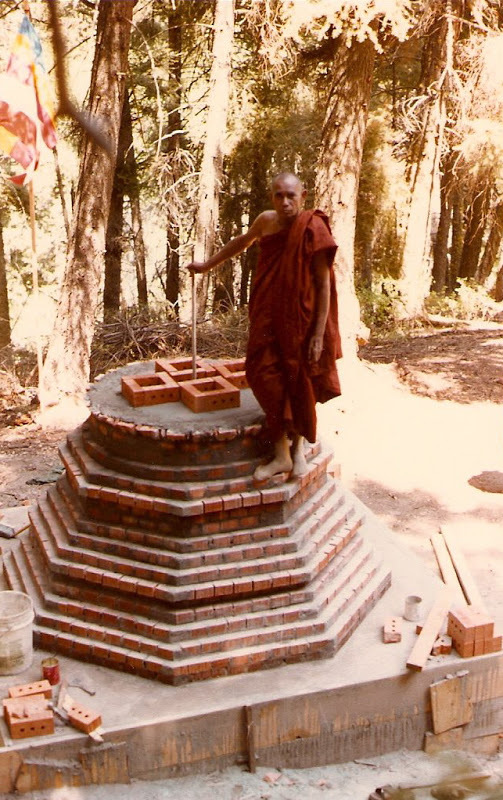 Sayadaw built the second pagoda beginning on the new moon of March, 1947 in Pa-ouk Village. This pagoda was built for the merit of all beings, for the benefit of all sentient life. It was Sayadaw’s conviction that opportunity should be given to as many people as possible to contribute to this meritorious building of the pagoda. Each being wishing to contribute could give nine 1-pyas coins, nine 25-pyas coins, nine 50-pyas coins, or the maximum of nine Burmese kyats. In this way many beings supported the meritorious building of the pagoda, which was consecrated in early April, 1947. The Ven. Sayadaw returned to the bamboo meditation hut behind the Shwe Dagon Pagoda in late April. There he built a mandala pagoda of sand, with the determination and commitment that “by this meritorious action may many beings be healed of obstructions in both mind and body”. Approximately 20,000 beings received benefit from the building of this pagoda, experiencing relief from mental and physical ailments. The fourth pagoda was the Dat Pon Zon Aung Min Gaung Pagoda off Windermere Road. Its history is as follows: U Pho Nweh requested the Ven. Sayadaw to come to his home to accept Kahtina robes. Once the Sayadaw arrived, U Pho Nweh told him that on this land there was the site of an ancient pagoda, for one could see very old bricks, just slightly exposed, on top of a hill. He requested that the Ven. Sayadaw accept five acres at this site and construct a pagoda there. At the conclusion of a meditation retreat during which he considered this request, the Ven. Sayadaw journeyed to Popa to ask the advice of the Bodaw Aung Ming Gaung. On the Bodaw’s advice the Sayadaw accepted the land and conferred with U Pho Nweh and the builder U Ba Maung on how to realize the Noble Wish of constructing a pagoda. U Pho Nweh’s brothers, sisters, and entire family supported the construction of this pagoda, and the foundation was begun on January 13, 1949. 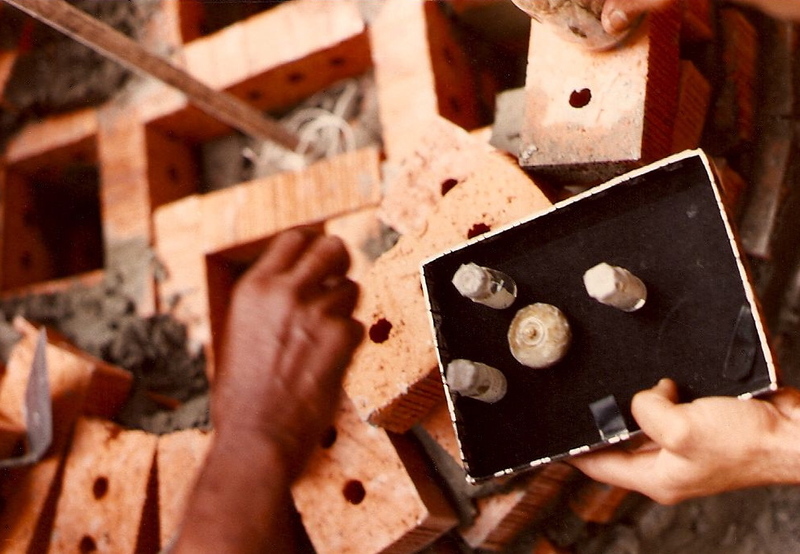 Many beings had seen lights coming from the site of the ancient pagoda, and when constructing the new pagoda the ancient relic chamber was found. Also many new holy relics were placed in the pagoda, which was named Dat Pon Zon Aung Min Gaung Pagoda: “the site of the coming together of the old and new relics”. Surrounding the central pagoda 20 smaller pagodas were constructed. More of the 174 pagodas on the 5-acre section of Dat Pon Zon Monastery. Pilgrimages in India, Sri Lanka, Thailand and Cambodia (1952-1957). In mid-March, 1952 the Sayadaw left for Sri Lanka and India on an extended pilgrimage to the Holy Places of Buddhism. Near Colombo he visited the Great Monastery of Anuradhapura, the Maha Cetiya, and the Great Ordination Hall. In Mihintale the Ven. Sayadaw meditated on the mountain wher eMahinda, the son of Ashoka, the great Indian Emperor who embraced Buddhism, had achieved Arahatship. He then visited Kandy and the Temple of the Tooth, which contains a revered relic of Gotama Buddha. Moving onto India, the Ven. Sayadaw first visited Bodhgaya the site of the Buddha’s Awakening, and then to Rajagiri, which was the first rainy season retreat of the Buddha, as well as being the site of the first great Deer Park, near Benares, where the Buddha gave his first discourse. This was the Dhamma Cakka Pavattana Sutta, or the Discourse of the Turning of the Wheel of the Law, which was heard by his first five disciples. The Ven. Sayadaw also visited two other places revered in the Buddhist tradition: Kusinara, where the Buddha entered into parinibbana, and Savatti, where the Buddha gave many discourses, including the Mangala Sutta. All told, the Ven. Sayadaw spent 49 days in India and two weeks in Sri Lanka before returning to Dat Pon Zon Pagoda in Burma. He continued living for five years under a large tree ther, as he had since 1947, refusing any type of more permanent lodging to be built for him. At long last, he accepted support to build a more permanent monastic structure, made of wood, on the five-acre site of Dat Pon Zon Aung Min Gaung. Beginning in 1955, the Ven. Sayadaw began a new series of pilgrimages. In November, he travelled to Thailand, visiting a great number of the sacred temples and pagodas in Bangkok and Chian Mai, continuing his dhamma meditations there. At these six places, where the Buddha had taught and where many great Arahats have attained complete liberation, the Ven. Sayadaw continued his meditation practice, gaining much strength. Continuing on to Sanchi, via Delhi, the Ven. Sayadaw meditated at the pagoda there, where the relics of the great Arahats Sariputta and Mogallana are enshrined. He travelled to Ellora and Ajanta where large temples and Buddha statues have been carved from stone. At Aurangabad, he gave instruction to the university faculty and changed the suttas for the happiness and protection of all beings. “Kusala, the wholesome, is Mind. Akusala, the unwholesome, is also Mind. Whether you meditate or not, stay or go, all is Mind. But don’t use this as an excuse, for laziness, for without Samadhi the unwholesome will surely come. The lin-lun-bin tree, where the Buddha continued to realize the fruit of samma sambuddho – the seventh place. The Ven. 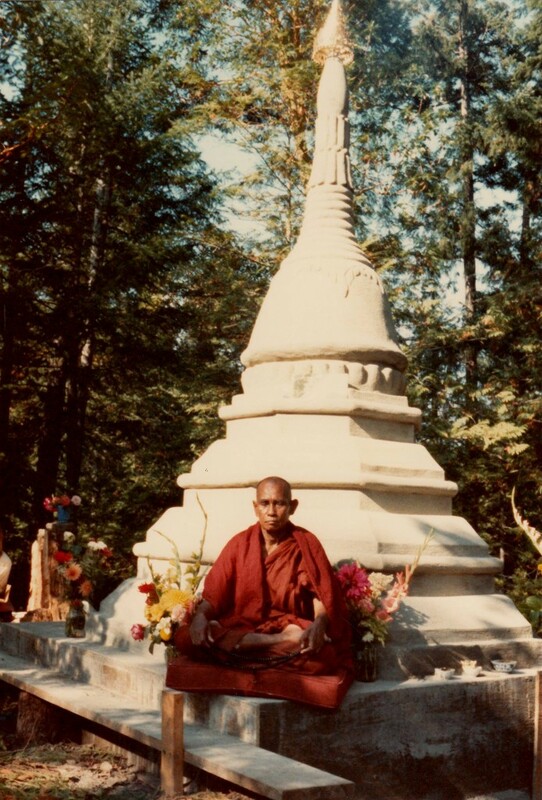 Sayadaw spent seven days in intensive meditation at each of these and, at the conclusion of his retreat, gold-leaved a statue of the Buddha at Bodghaya in honour of the Buddha, the Dhamma, and the Sangha. He then stayed at the monastery of U Ottama, where he was received most courteously, before returning by ship to Rangoon. The ship’s name was Aung Thit Sa, or “Success of the Truth”. On board, the Ven. Sayadaw was given a cat which he brought back with him to Dat Pon Zon Aung Min Gaung. This was the first of many cats that he was to nurture and train there. In April of 1957, the Ven. Sayadaw returned to Thailand, bringing with him a standing statue of the Buddha. It was placed at a temple in Bangkok and many people gathered for the consecration. He travelled on to Cambodia, stopping at Phnom Penh, then at Angkor Wat, where he visited the ancient monastery supported by the famed King Melinda. He saw the fabulous stone sculptures and architecture that have made Ankor Wat world famous. The superb craftsmanship of the statues of Buddhas, Arahats and Devas, and of the buildings themselves – all over a thousand years old – is a wonder to all who visit them. From Bangkok, the Ven. Sayadaw flew back to the growing Dat Pon Zon Aung Min Gaung Monastery, which by now had a 120 ft. monastic building, which three large shrine rooms and space to house up to 20 monks. In March 1958, the Ven. Sayadaw set off by ship, heading for New York to build the first pagoda in the United States. This journey was the result of a request by Mr. Gus Ruggieri of Allegany, New York. The London-bound ship made ports of call in Sri Lanka and Aden, and then struggled through three days of extremely rough seas on the Mediterranean before arriving in Southampton in mid-April. Met by the Second Secretary of the Burmese Embassy, U Maung Maung, the Ven. Sayadaw was escorted to the Buddhist Society Monastery in London. He received the kind and courteous attention of His Excellency the Ambassador U Aung Soe during his 12-day stopover. On the first day of May, the Ven. Sayadaw boarded the famed Queen Mary. This gigantic ship, now permanently berthed in a California port, is 1,020 feet long, 180 feet wide, and carried a crew of 1,500 and up to 3,000 passengers, travelling at a speed of 35 to 40 knots. This portable city, with its 12 decks, 3 swimming pools, 3 tennis courts, and 3 restaurants, was a striking departure from the simple life of the monastery. No less astounding were the enormous buildings of New York where, upon his arrival, the Ven. Sayadaw first lodged in a hotel with 32 stories and thousands of rooms. During his three-day stay in the city, he received the generous support of U Thant, at that time a member of the Burmese Embassy to the United Nations. He then travelled on to Albany on May 9th to stay at the home of Mr. Ruggieri. A week later the Ven. Sayadaw, at the invitation of the students and faculty of the University of Buffalo, gave a series of Dhamma discourses, lasting ten days. He took a side trip to Niagara Falls and gave an interview for American television before returning to Allegany to make plans for the construction of the pagoda. There he conducted another interview, this time on radio, with the assistance of the translator, the Ven. U Adissa Ransi. He spoke about the planned pagoda and chanted the Suttas of Protection and of Buddha’s Blessing for the welfare and happiness of all beings. Construction of the pagoda on the 64-acre property of Mr. Ruggieri began on the 30th of May and was finished just seven days later. Rapid progress was made possible not only by the work of the Ven. Sayadaw himself, but of the Ven. U Adissa Ransi, and the assistance of Mr. Joe Serrano. [photo] The Ven. 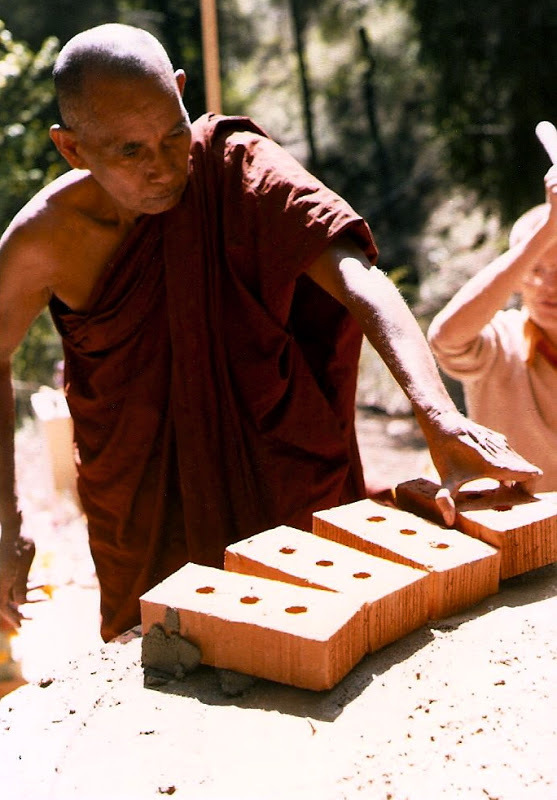 Sayadaw with translator U Adisa Ransi construction the American Shwe Dagon Pagoda, Allegany, New York, 1958. Various relics of the Buddha and the Arahats, placed in the Ven. Sayadaw’s begging bowl, along with two precious statues of the Buddha made from a southern branch of the Bo tree, were housed in the pagoda. The consecration ceremony was held on June 6, 1958. The pagoda was named the American Shwe Dago, in honour of the 2,500-year-old Shwe Dago Pagoda in Burma. This latter stricter began as a humble 10-foot structure, the same as the American one, but was subsequently built to a height of over 300 feet. [photo] Mr. Gus Ruggieri, sponsor of American Shwe Dago Pagoda, 1958. The Ven. Sayadaw travelled next to Washington D.C., where he was received by His Excellency Ambassador U Win. During his stay in the American capital he also received the kind attention of U Min Han and other lay disciples, and was welcomed to the house of Lt. Aung Nyunt where a feast was prepared. The Lieutenant had a beautiful shrine room full of statues of the Buddha, and a phot of the great Bodaw Aung Min Gaung. Upon request the Ven. Sayadaw gave instruction in Buddha Dhamma, particularly encouraging the meditation practise of Buddha Anusati or the Recollection of the Buddha. He explained that the rpacice of this meditation with a firm commitment will gradually increase the calm and power of samadhi, which leas to both inner and outer success. The essential foundation for practice is a firm determination, or adhitthana, that enables one to practise daily no matter what obstacles arise. Leaving Allegany on July 6th, the Ven. Sayadaw returned to New York City, where he was again received by U Thant. At Mr. Thant’s request, he gave instruction in the meditation practices, particularly Buddha Anusati. He explained that with the proper understanding and commitment to the Teaching, which is for the benefit of all beings, Mr. Thant could perform many meritorious actions and progress to a position of high importance in the world. The Ven. Sayadaw assured him that he would radiate loving kindness and wishes for his success, but that the most essential thing was continued commitment and effort in the practice of Buddha Dhamma. On July 10th, the Ven. Sayadaw boarded the “United States”, a ship bound for England. It was slightly smaller than the Queen Mary: 990 ft. in length, 111 ft. wide, with a crew of only 1,000 and room for scarcely 2,000 passengers. Docking at Southampton five days later, the Ven. Sayadaw travelled by rail to London the same day. He returned to the Buddhist Society Monastery, and once again received the generous support of His Excellency Ambassador Aung Soe and family, as well as from U Thein Han, the Embassy’s Military Attache. On his initial visit to London, the Ven. 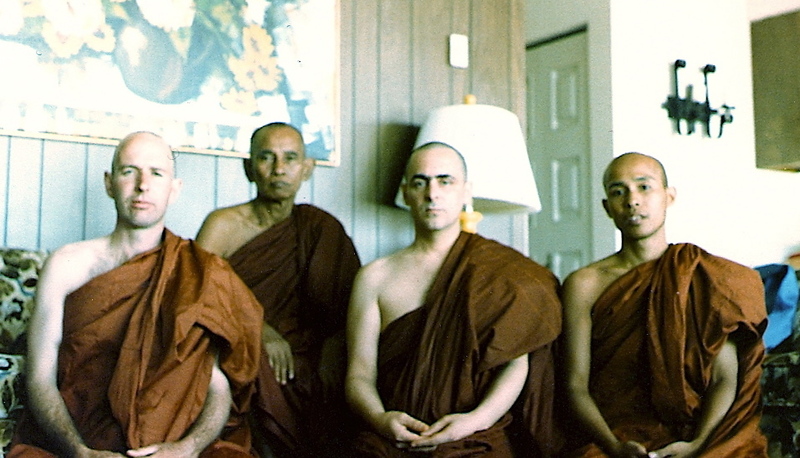 Sayadaw, while staying at the Buddhist Society Monastery, had met a Canadian named Leslie Dawson. This young man frequently came to the monastery to ask questions of the resident monks and U Thet Thila of Burma concerning the teachings of the Buddha. 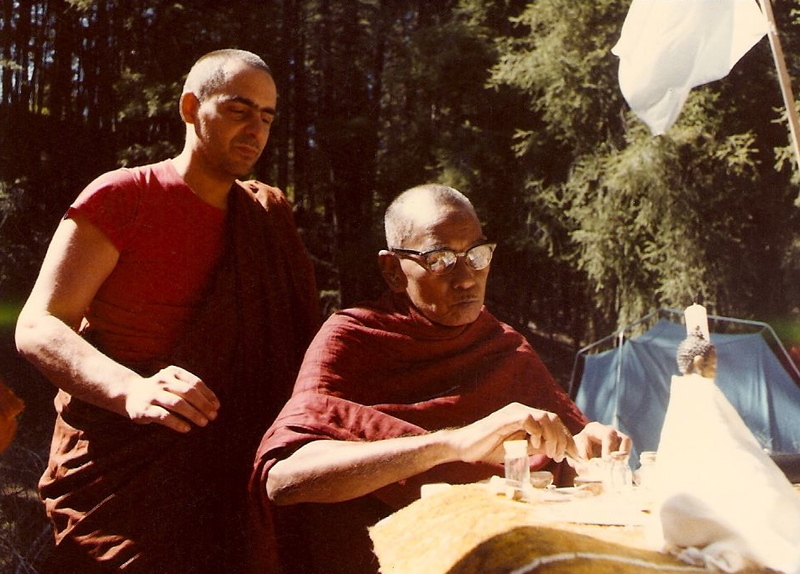 He was very interested in becoming a monk and had already studied three books of the Vinaya (the training of the monastic life) as well as reading and investigating other aspects of the Dhamma. The Ven. Sayadaw had advised him to prepare to return to Burma with him once the pagoda in American had been completed. Upon his returned to London from America, the Ven. Sayadaw continued to instruct Mr. Dawson in Dhamma practice and, at the same time, arranged a Burmese visa for him. They agreed to meet in Bodhgaya in order to travel the last leg of the journey to Burma together. On July 24th, the Ven. Sayadaw left England on the “Jala Dharma”, an Indian ship bound for Italy. He arrived in Livorno six days later where he aroused the interest and curiosity of the local people. They were full of questions about his robes and the teachings of the Buddha. After a brief visit to the Leaning Tower of Pisa, the Ven. Sayadaw journeyed onward to the Suez Canal, through its vast central lake which can hold up to 200 ships, and on the other side to the Red Sea. Stopping in Aden on August 6, they arrived in Bombay nine days later. After a two-day train trip, the Ven. Sayadaw arrived in Bodhgaya on the 20th, where he was again kindly received at the monastery of the Ven. Sayadaw U Ottama. Being the site of the Buddha’s enlightenment, Bodhgaya is a highly beneficial place to practise Dhamma, and there the Ven. Sayadaw began a second 49-day session of intensive meditation. As before, the retreat was carried out in the seven locations where the Buddha had practised after his Awakening. In honour of the Buddha and the successful completion of the Ven. 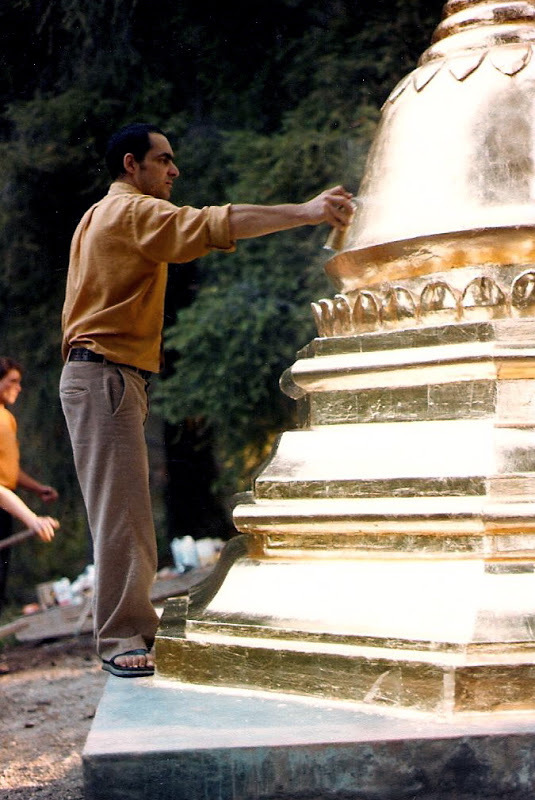 Sayadaw’s practice, the trustees of Bodhgaya gave permission for him to goldleaf a statue of Buddha in the large pagoda. May all beings, whether human or divine, share the merit of this practice. In October, at the request of U Nanda Wunta, the Ven. Sayadaw began the construction of four pagodas on the roof of the Ordination Hall in Benares. Here, at this seventh site of pagodas built by the Ven. 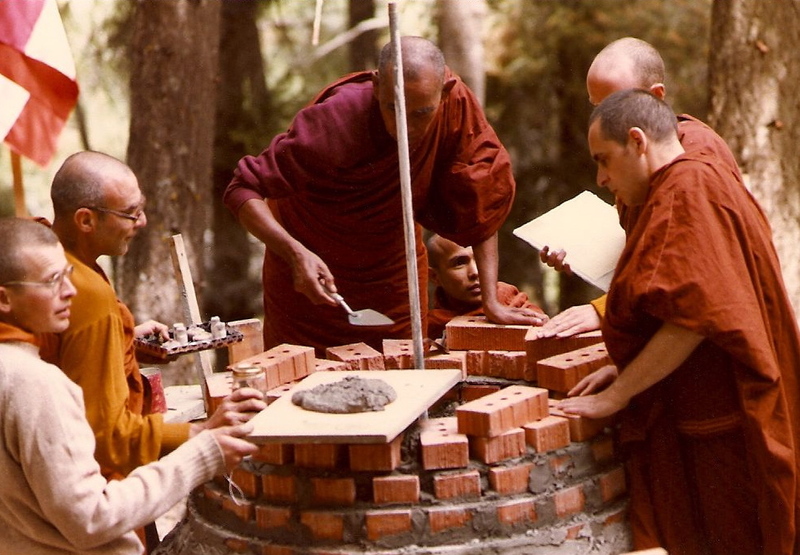 Sayadaw, the construction proceeded smoothly, and the merits of the work were shared by all beings. During the Ven. Sayadaw’s final week in retreat at Bodhgaya, the young Canadian had arrived, requesting ordination. The Ven. Sayadaw had assented, but felt that first Mr. Dawson should make arrangements with Burmese officials in Calcutta concerning his plans to study in Burma. Now, upon the Ven. 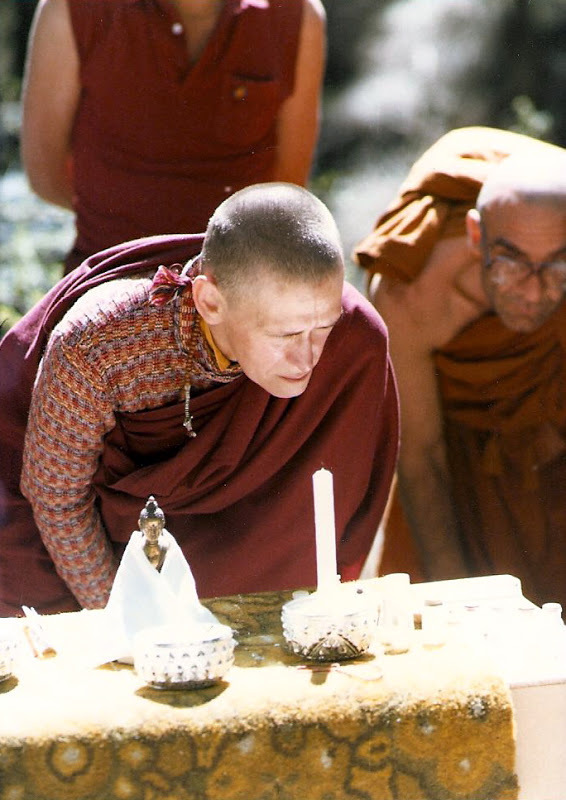 Sayadaw’s return to Bodhgaya following the completion of the pagoda in Benares, Leslie Dawson was ordained as a novice monk on the 28th of October, 1958. He was given the name Ananda Bodhi. From Bodhgaya, the Ven. Sayadaw journeyed to Calcutta, where he was graciously received by Consular Members of U Tin Nyunt and his wife Dew Mya Mya, Daw Kyi Kyi, and children. Among his outstanding memories of this visit is a magnificent banyan tree, which spreads over five acres. On November 14 he returned to Rangoon via Bangkok to share the merit of his visit to the West and India with all beings. As for the young Canadian, he became a fully ordained Buddhist monk in the Great Ordination Hall at the south gate of the Shwe Dagon Pagoda in Rangoon on December 21, 1958. After engaging in intensive meditation practice in Burma, the Ven. 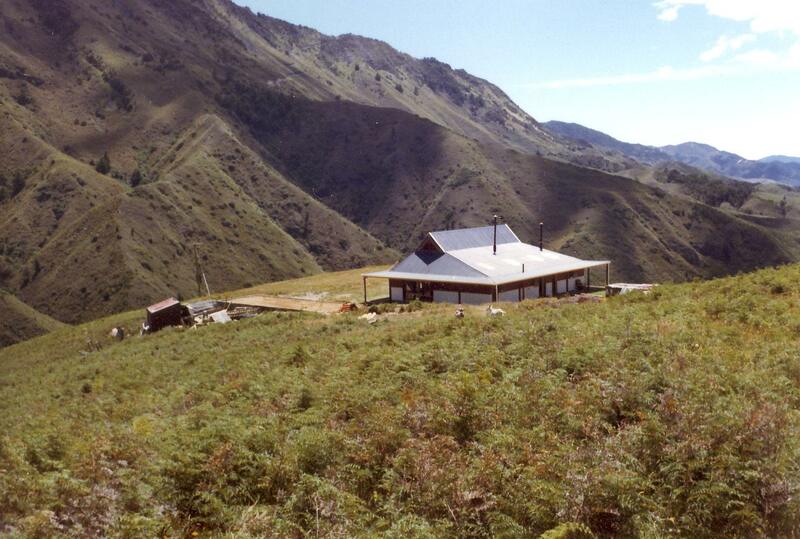 Ananda Bodhi studied in Sri Lanka and Thailand before returning to London where he shared the Dhamma with many beings. After three years in England, he returned to his home country to found the Dharma Centre of Canada, which has a 400-acre meditation centre near Toronto. In the late 1960’s, the Ven. 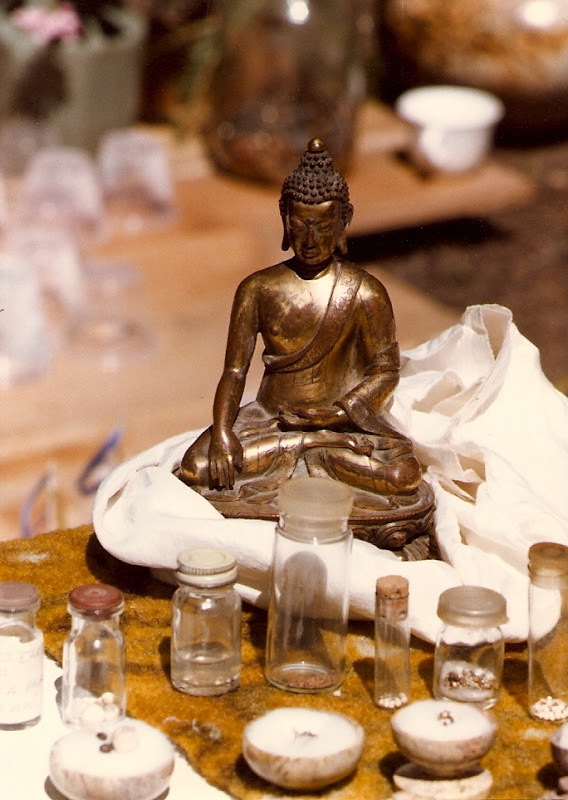 Ananda Bodhi, out of great compassion for all beings, began taking the Dhamma around the world, teaching in Europe, Asia, Australasia and the Americas. It was his students who initiated and supported the second journey to the West of the Ven. Sayadaw U Thila Wunta in 1982. On May 1, 1959 on the island of Bilugyin in the Township of Chaung Zon, the Ven. Sayadaw began reconstruction of a very ancient pagoda that was approximately 40 feet in height, building a new 55-foot pagoda over the old one. With the holy relics were placed 15 statues that were known for thir holiness. This was the eighth occasion and the merit was shared for the benefit and well being of all. The ninth time was the reconstruction of an old pagoda located on Aung Say Kyung Island, north of Moulmein at the mouth of the Salwean River on December 28, 1963. This pagoda was rebuilt to its original height of 110 feet, with the first umbrella ring having a diameter of 6 ½ feet. (The umbrella is the very top portion of a pagoda comprised of rings, in decreasing diameters, crowned at the top by precious gems. The consecration ceremony of a pagoda takes place when the umbrella shaft with its rings and precious gems is placed on top of the pagoda.) Surrounding this large central pagoda were two concentric rings, each containing ten pagodas, making a total of 21 pagodas that were reconstructed. The Ven. Dat Pon Zon Sayadaw carried out this meritorious work with the help of the Pa-ouk Sayadaw U Wara Linka and the Mandalay Sayadaw U Nanda Thara with the help of many lay supporters from Pa-ouk. The crowds were so lareg at the festive consecration ceremony that 30 large bags of rice were cooked for all the people. The tenth occasion was in Samalauk Village, Nyaungdon Township on the Samalauk Andawgon Monastery. This ancient pagoda was also 110 feet in height, the first umbrella ring having a diameter of 6 ¾ feet. There was an unfortunate occurrence during the reconstruction on one night when the police became involved. They had mistaken the identity of a group of beings who had been revering the pagoda in traditional royal dress and who were on their way back to their village. Although some difficulties ensued, the reconstruction was completed successfully with the help of Ven. Sayadaw U Sandemar of the Andawgon Monastery. The consecration ceremony was held on April 25, 1964. May the merit be shared with all. The eleventh occasion was in Kamakay Village on Bilugyun Island, Chaungzon Township in Mon State and was begun on January 5, 1966. This was also an ancient pagoda, and reconstruction took over one year. According to tradition, hair relics of Gotama Buddha were enshrined within. The diameter of the first ring of the umbrella was 7 ¾ feet. Surronding the central pagoda 20 smaller ones were also reconstructed at this time, along with statues of Lord Buddha and statues of heavenly beings. This work was done under the guidance of the Ven. Dat Pon Zon Aung Min Gaung Sayadaw U Thila Wunta, the Ven. Taya Sayadaw U Sandasara, the Ven. Pa-ouk Sayadaw U Wara Linka and the Ven. Mandalay Dhammi Karama Monastery Sayadaw U Nanda Thara. Many beings co-operated successfully together for the meritorious completion of the Kyaikta Pagoda. Sadhu Sadhu Sadhu. [photo] Buddha and Arahat relics. The twelfth occasion was in Bassein which is located in the compound of the military command of the Irrawaddy Division. This pagoda was 75 feet hight, the diameter of the umbrella being 5 ¾ feet. Reconstruction work was begun on February 23, 1967 and the consecration ceremony was held exactly three months later. Construction was done under the supervision of the Ven. Dat Pon Zon Aung Min Gaung Sayadaw. May this action be shared in order that all the noble wishes of all beings be fulfilled. The thirteenth occasion was in Ankhe Village, Thanbyuzayat Township, near Moulmein and was the construction of a large meditation hall with an adjoining pavilion which houses sculptures and murals depicting the life of the Buddha. This project was located at the Ankhe Taik Monastery. The hall known as Dhammayon is 117 feet in length and 70 feet in width, with a shrine over 13 feet in height. There were over 100 statues and murals used in the depiction of the life of the Buddha. Construction was completed on June 11, 1968 under the supervision of the Ven. Dat Pon Zon Sayadaw and the second Ankhe Sayadaw Ven. U Nyana. Sadhu Sadhu Sadhu. The fourteenth occasion was on March 25, 1970, when the Ven. Dat Pon Zon Sayadaw, along with the chief abbot of the Ywathit Village Monastery, the Ven. U Sanda Thara, and the Ven. Mandalay Sayadaw U Nanda Thara, supervised the offering of two new umbrellas tow pagodas in Chaungzon Township near Moulmein. These were completed successfully. 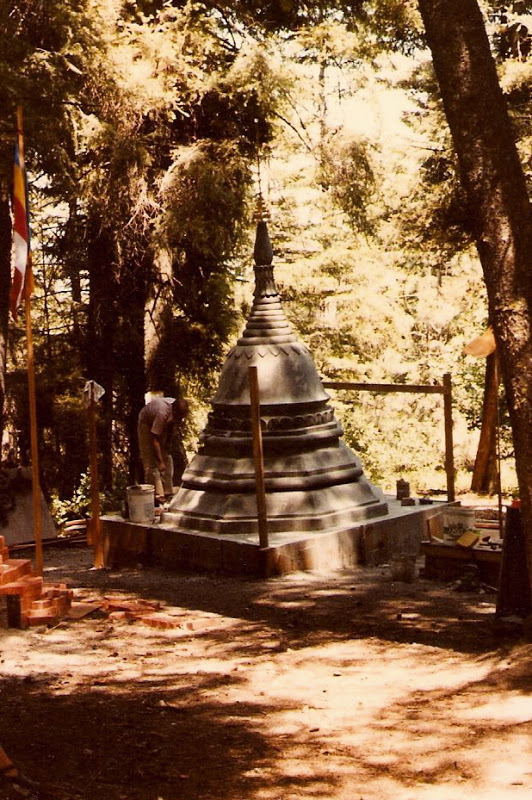 The fifteenth occasion was on March 19, 1971 in Muyit Kalay Village where there was the reconstruction of an old pagoda under the guidance of the Ven. Dat Pon Zon Sayadaw and the two Sayadaws above. May this meritorious action be shared with all. The sixteenth occasion was the repair and placement of a new umbrella on a very deteriorated pagoda also located in Muyit Kalay Vilalge on April 6, 1972 with the help of the same two Sayadaws. The seventeenth occasion was in Tazinyekyaw Village in Nyaungdon Township on June 29, 1973 when a new pagoda was constructed over an old pagoda to a new height of 38 feet. Supervision of the construction was undet the Ven. Dat Pon Zon Sayadaw and the Ven. Samalauk Sayadaw U Sandemar. It was completed successfully. The eighteenth occasion was at Pa-ouk Taik Monastery in udon Township where there was the renovation of a seven-foot Buddha statue, 10 Arahat statues, and statues depicting creatures that were half human and half animal. Renovation work went very well under the Ven. Dat Pon Zon Sayadaw and the Ven. Pa-ouk Sayadaw U Wara Linka. May the merit be shared for the welfare and happiness of all beings. The nineteenth occasion was on March 7, 1974 when a new pagoda was built in Yankin Township in Rangoon. It was built on a site where, according to tradition, an ancient pagoda had once stood. Present at the foundation ceremony of the new pagoda where the Ven. Masoeyain Sayadaw and the Ven. Chauk-Htetkyi Sayadaw. Under the guidance of the Ven. Dat Pon Zon Sayadaw it was finished within two years. One of the Ven. Sayadaw’s largest pagodas, it measures 108 feet across and as many feet high. Adjoining this pagoda is a series of 1,500 five-feet high marble tablets, upon which the entire Buddhist tripitaka is carved. The twentieth occasion was in Meizali Village in Nyaungdon Township and was the reconstruction of an old 40-foot pagoda as well as a 7-foot Buddha statue. Both were renovated and consecrated on March 5, 1974 under the guidance of the Ven. Dat Pon Zon Sayadaw and Ven. Sayadaw U Sandemar. The twenty-first occasion was in Ankhe Village, Thanbyuzayat Township where an old pagoda 49 feet in height was renovated under the guidance of the Ven. Dat Pon Zon Sayadaw and the Ven. Sayadaw U Nyana. 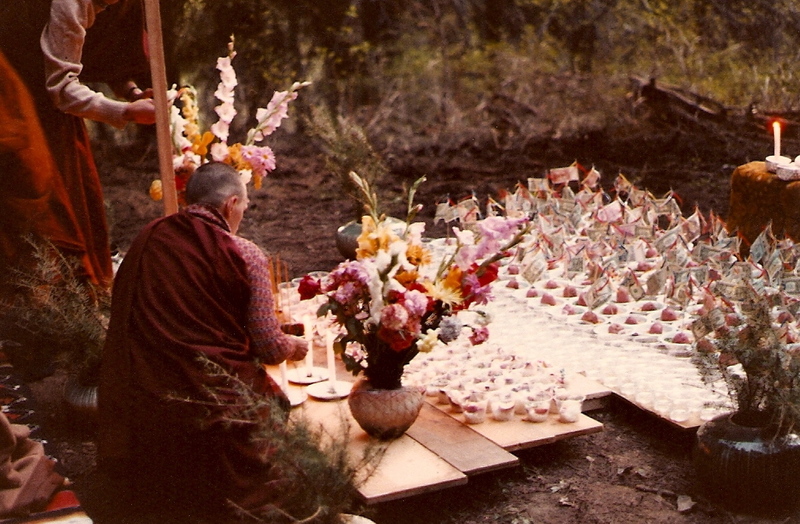 The auspicious consecration ceremony was held on December 1, 1974. The twenty-second occasion was the renovation and placing of a new umbrella on a pagoda in the Shwegu Monastery on Nyaungdon Township. 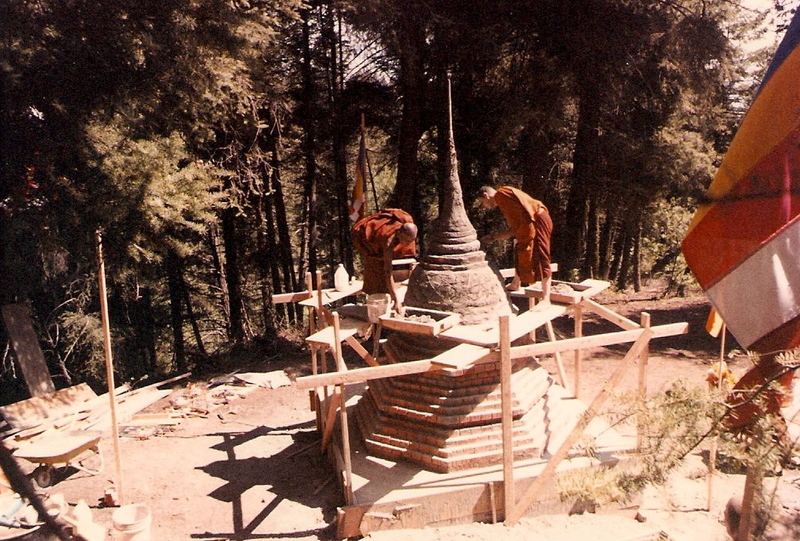 This work was completed on February 25, 1975 under the guidance of the Ven. Dat Pon Zon Sayadaw and the Ven. Sayadaw U Sandemar. The twenty-third occasion was on the north side of Taleithan Village where an old pagoda 31 ½ feet high was renovated. It was consecrated on May 5, 1975. This was done under the guidance of the Ven. Dat Pon Zon Sayadaw and the Ven Sayadaw U Sandemar. The twenty-fourth occasion was in the Village of Karuppi at the railway station monastery in Thanbyuzyat Township. A new pagoda was built here over an existing pagoda under the direction of the Ven. Dat Pon Zon Aung Min Gang Sayadaw U Thila Wunta. It was consecrated on January 27, 1978. 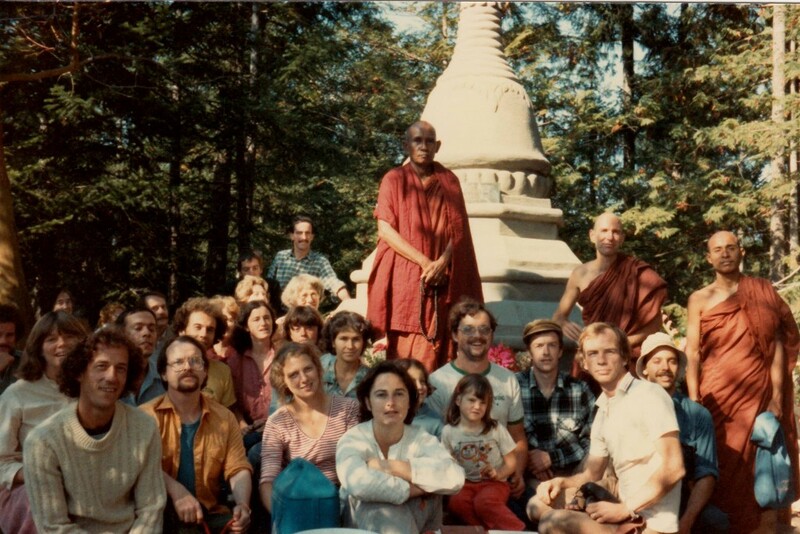 The twenty-fifth occasion, on April 22, 1978, was also in the Village of Karuppi at the Paya Monastery where an old pagoda was renovated and a new umbrella was placed. 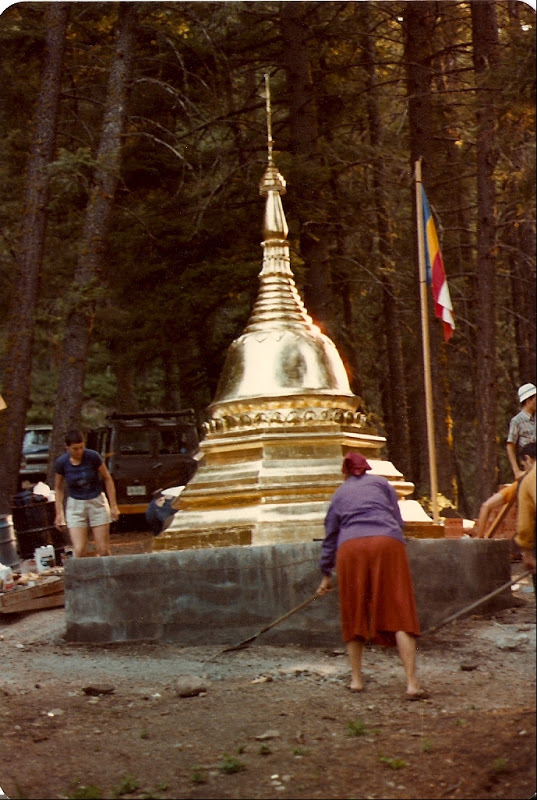 The twenty-sixth project, on March 16, 1978, was in Wekalaung Village, Thanbyuzayat Township where a 34 ½ foot high pagoda was renovated and a new umbrella was placed. During these years the Ven. Sayadaw, as abbot of Dat Pon Zon Aung Min Gaung Monastery in Rangoon, had continued to build pagodas at the five-acre monastery until there were over 174 pagodas of varying sizes, three large meditation halls, and 20 secluded meditation cells for intensive meditation practice. In January 1981, on the island of Bilugyin in Chaungzou Tonwhsip on Nat-Taung Mountain near Muyit Kalay, a new umbrella was begun for a very ancient pagoda. The umbrella, having a diameter of 7 ½ feet, was placed in the pagoda at 3 p.m. on April 19, 1981. The height of the pagoda is 90 feet and the renovation work was under the supervision of the Ven Dat Pon Zon Sayadaw and Sayadaw U Sandemar. On Feburary 1, 1981, the Ven. Sayadaw U Thila Wunta ordained a young American at the Ordination Hall of Thabyay-tawya on Windemere Road. He was given the name U Pannanada. The participants of the first recitation of the Kammavaca were: the Ven. Pa Htan Sayadaw with 45 years of monastic life, the Ven. Shwe Pyi Daw Sayadaw with 43 years of monastic life, and the Ven. Sayadaw U Kaw Than La with 34 years of monastic life. The participants in the second recitation of the Kammavaca were the Ven. Kadonse Sayadaw U Razeinda with 61 years of monastic life, the Ven. Sayadaw U Nya Wuntha with 55 years of monastic life, and the Ven. Dat Pon Zon Sayadaw U Thila Wunta with 49 years of monastic life. Just over a year later, on February 23, 1982, another American arrived requesting ordination from the Ven. Sayadaw. The ordination took place on March 14, again at the Thabyay-twaya Ordination Hall, the name U Bodhi Nanda was given. The Ven. Dat Pon Zon Aung Min Gaung Sayadaw, U Thila Wunta was the Preceptor. The first Kammavaca was chanted by Ven. 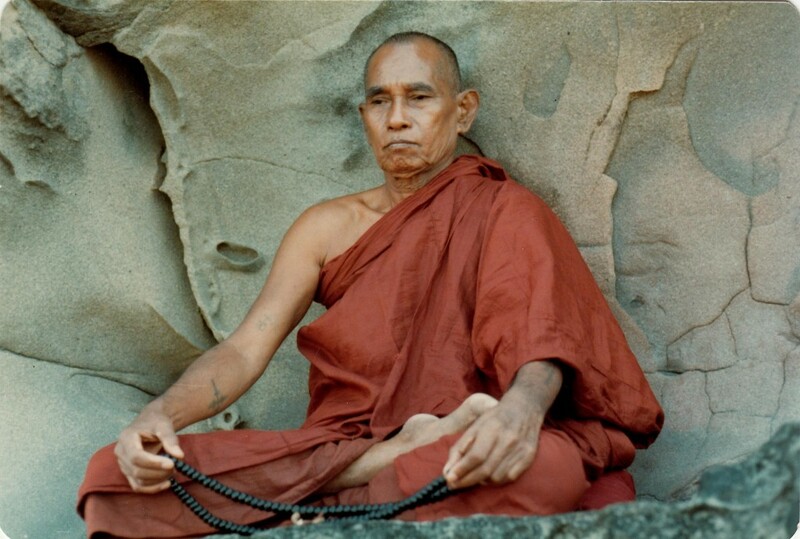 Sayadaw U Sobhita, Sanga Mahanayaka with 52 years of monastic life; the second Kammavaca by Ven. Sayadaw U Razeinda Wuda of Shwe Pyi Monastery with 45 years of monastic life; and the third Kammavaca was by the Ven. Sayadaw Thiri Mangala of Pyaw Bwe Monastery. All together there were 23 monks present at the ceremony, including the Ven. Sayadaw U Obasa from Pya Pon Taikthit Monastery of the Sanga Mahanyaka Council. Both of the Americans were students of the Ven. Ananda Bodhi, the Canadian whom the Ven. Dat Pon Zon Aung Min Gaung Sayadaw U Thila Wunta had ordained back in 1958. In 1981 the students of the Ven. Ananda Bodhi requested the Ven. Sayadaw to give the Teachings of the Buddha in the U.S., Canada, New Zealand and Australia to strengthen the Buddha Sasana in the West. Leaving Rangoon on the evening of April 24, 1982 the Ven. Sayadaw flew to Bangkok. After a week’s stay in Thailand, he continued flying eastward. After a one-hour stopover at Narita Airport in Tokyo, he took the half-day flight across the Pacific to Seattle International Airport. He was welcomed to the U.S. by students of the Ven. Ananda Bodhi, who drove him the following day down the scenic coast of Oregon and into California. They stopped to view the ancient, soaring redwood trees, many of which were already growing at the time the Buddha was teaching over 2,500 years ago. After one night lodged on the shores of the Pacific Ocean, the Ven. Sayadaw arrived at the San Francisco home of U Aung Myint. He stayed there for a week, receiving kind and courteous support. On the early morning of May 10th, the Ven. Sayadaw left by car for Los Angeles for another week’s stay, this time at the home of Daw Toke. While in L.A. he saw, among other things, the amazing aquatic performances at Marine World, and the ship that had carried him to the U.S. in 1958, the Queen Mary, now a Long Beach landmark. Daw Toke and many supporters in the Los Angeles area who had not seen the Ven. Sayadaw for ten years were overjoyed at his presence and attended to his needs with much generosity. 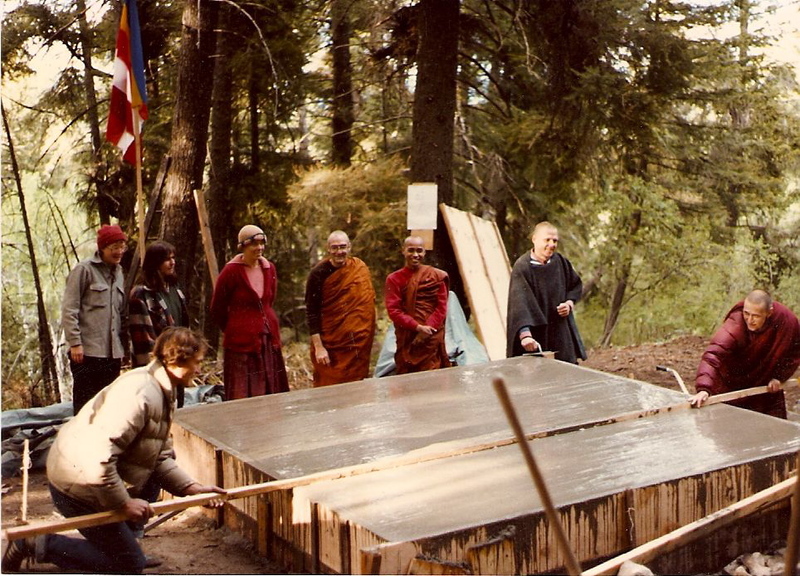 On May 17th the Sayadaw left Los Angeles, and after spending one night near Yosemite National Park in California, reached Boise, Idaho after an 18-hour drive. On the afternoon of May 19th, the Ven. Sayadaw ordained as novices a son of Daw Toke and an American, U Teja Nanda at the Open Path Center in Boise. This centre was founded by students of the Ven. Ananda Bodhi and is the residence of two Americans ordained in Rangoon, U Bodhi Nanda and U Pannananda. The following morning the two novices received full ordination aboard a raft on Lucky Peak Reservoir. “A day off for Teaching” Taking of Precepts. 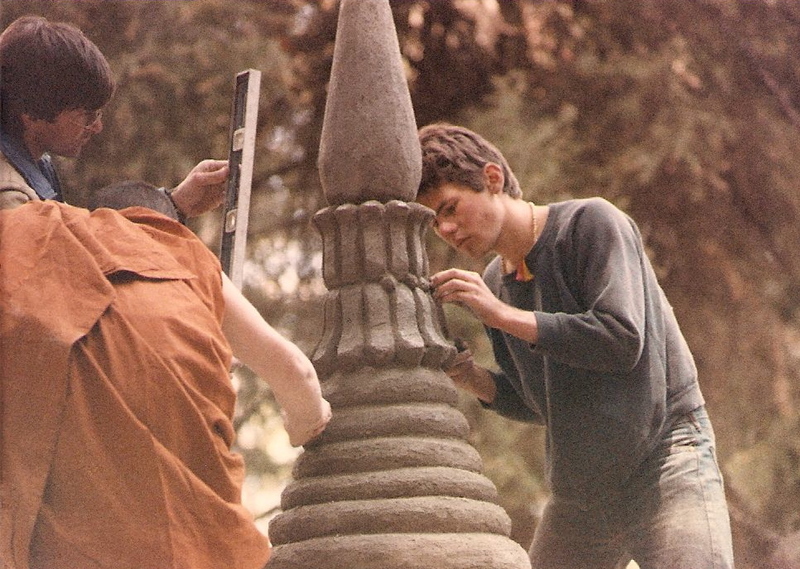 On May 22, construction of a pagoda near Boise was begun by members of the Open Path under the guidance of the Ven. Sayadaw U Thila Wunta. These students came from many countries: America, Canada, Norway, Switzerland, and South Africa. 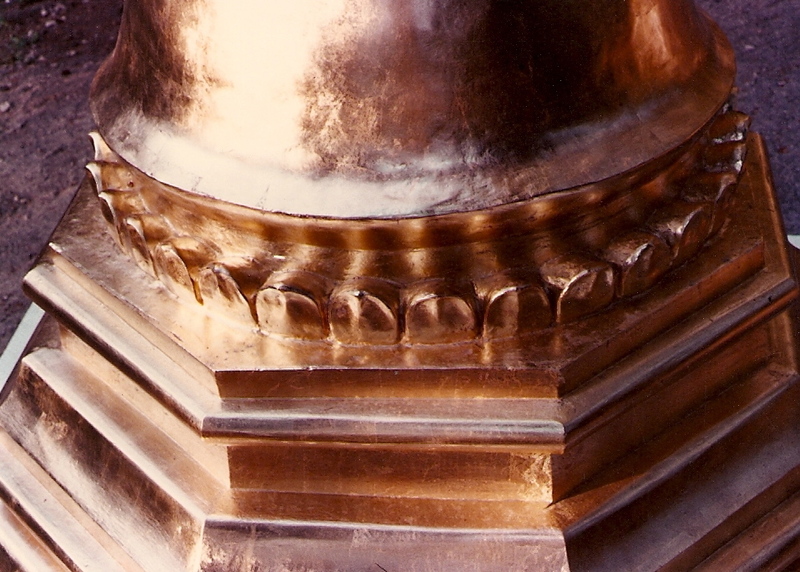 Ten days later, precious relics of the Buddha and the Arahats, along with a metal etching of the pathana, were placed inside the new pagoda. Known as the Cakkavala or Universal Pagoda, it was consecrated on the afternoon of June 11th. This was the second pagoda built in the U.S. by the Ven. Dat Pon Zon Aung Min Gaung Sayadaw U Thila Wunta. The Sayadaw was invited to America by the Ven. U Nandabodhi, Resident Teacher at the Open Path. Two monks from Boise greet venerable Burmese guests: Sayadaw U Thila Wunta, Abbot of Dat Pon Zon Monastery in Rangoon and Bhikkhu U Thishna. Evening of May 19, 1982. Novice Ordination takes place in the main shrine room of the Namgyal House. In the main shrine room at the Namgyal House in Boise, Idaho. Bhikkhus Ordination at Lucky Peak Lake above Boise, Idaho. May 20, 1982. Five days later, the Ven. Sayadaw left for Canada, spending one night in Washington State, the taking the ferry across to Victoria, British Columbia. He was met by students of the Ven. Ananda Bodhi, and that night chanted the suttas for the welfare of all beings, seen and unseen, far or near, and gave instruction in the Buddha Anusati, the Recollection of the Awakened One. The next day they travelled to the 20-acre Crystla Mountain Meditation Center on Galiano Island, near Vancouver, where the Ven. Sayadaw continued his instruction in the Dhamma. At this time, the Centre members discussed with him the possibility of his returning in September to build a pagoda. “If you have sukha, the pleasant, you have dukkha, the unpleasant. Buddha Language is to make them the same. Look closely at the mind in the morning when you are hungry, when you have lobha, greed. Even after you eat, still more lobha… and the process continues. By cutting the attachment to lobha, then to dukkha and sukha, there will be freedom. The Ven. Sayadaw moved on to Nelson, B.C. for a week-long visit to the Dharma Centre there. He chanted the Suttas of Blessing and Protection for the benefit of all beings and continued instruction on Buddha Anusati. His next destination was Edmonton, Alberta lying on the eastern side of the Canadian Rockies. It took two days to drive through the rugged, snow-capped peaks. The day after his arrival, the Ven. 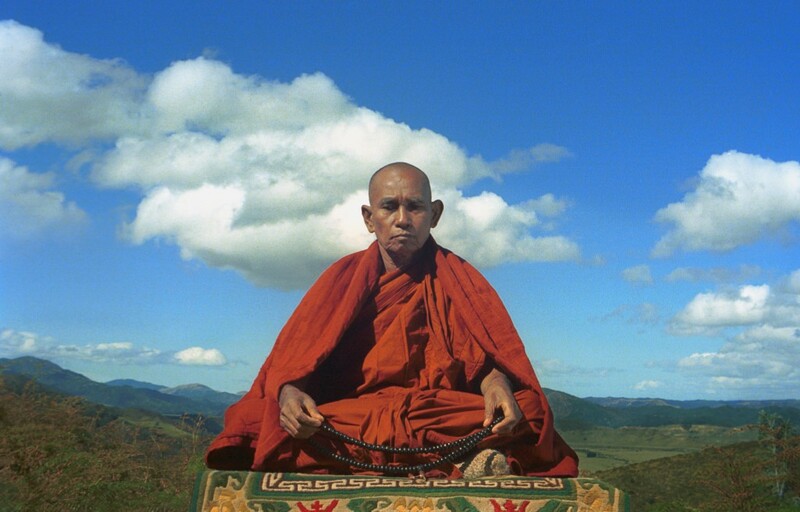 Sayadaw led a three-day intensive meditation in he rolling hills outside the city. The theme of the course was, again, Buddha Anusati, and the meditation on metta, radiating loving kindness to all beings. He remained almost two weeks in the Edmonton area, twice giving discourse at the Unitarian Church and, on other nights, giving puja and meditation instruction at the Dharma Centre. [photo] Meditation retreat near Edmonton, Alberta. On July 13th, the Ven. 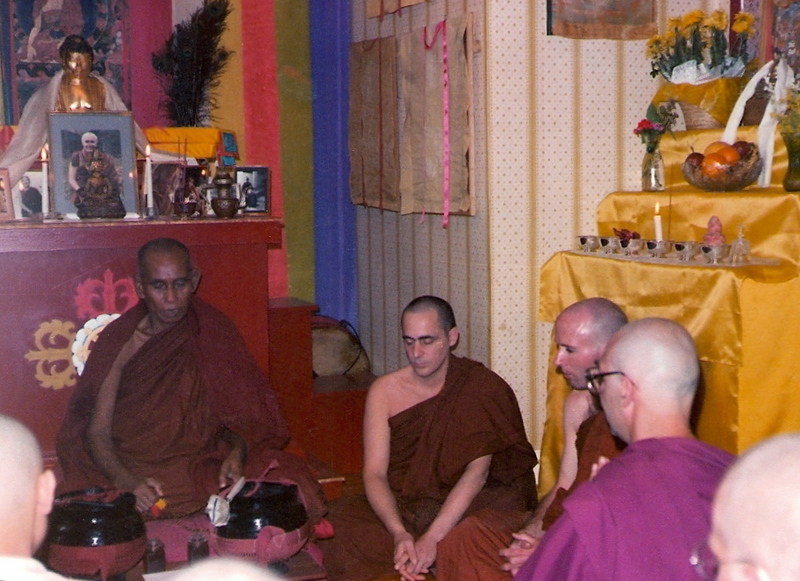 Sayadaw was driven to Calgary as the guest of the Aryan Theravadan Society. At the members’ request he remained for a week, giving puja and instruction in meditation practices, from araham to bhagava. From there he boarded a train for the journey across the Canadian prairies to Toronto, Ontario. He arrived, after three days travel, on July 23rd in Toronto, where he was greeted by members of the Dharma Centre of Canada, students of the Ven. Ananda Bodhi. After a night’s rest, the Ven. Sayadaw pressed on to Allegany, New York, to pay respects to the American Shwe Dagon Pagoda, which he had built in 1958. In Allegany, he went with Mr. Tony Lentola, a sponsor of the original pagoda, to the farm of Mr. Gus Ruggieri, where the pagoda was located. 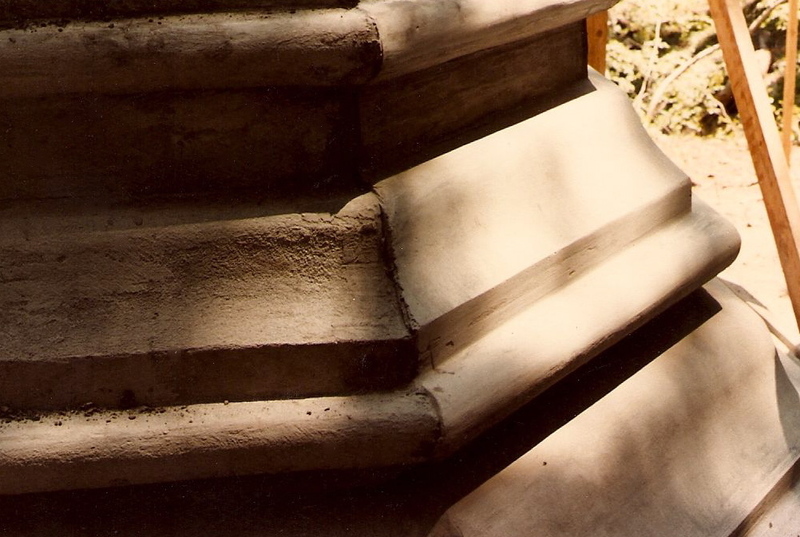 [photo] American Shwe Dagon Pagoda as found after 24 years in July, 1982. In the 24 intervening years, an entire forest had grown around the site, concealing the pagoda and obscuring a large beech tree that had been used to mark its location. They search d for the lost pagoda, and were on the point of giving up when the Ven. Sayadaw requested that all beings, human or divine, by the merit of the teaching of the Buddha, show him the pagoda. Immediately, the location of the pagoda, protected by the large, gnarled tree, was revealed. Under these happy and auspicious circumstances, the Ven. Sayadaw made the commitment to return and rebuild the American Shwe Dagon Pagoda in honour of the original sponsor, Mr. Gus Ruggieri, for the merit and happiness of all beings. On the 25th of July, the Ven. Sayadaw travelled to Washington D.C. to confer with His Excellency Ambassador U Kyaw Khine. They discussed the recently built Cakkavala Pagoda in Boise, Idaho and the strong meditation practice done during the two-week construction period. The Ven. Sayadaw asked the Ambassador’s advice on the re-building of the American Shwe Dago Pagoda. The Ambassador was most helpful in every way and arranged a meeting for the Ven. Sayadaw that very same day with His Excellencey U Saw Hlaing, Burmese Ambassador to the United Nations. U Saw Hlaing, too, was deeply appreciative of his efforts to strengthen the Buddha Sasana in the West. On July 28th, the Ven. Sayadaw left New York City for Canada, arriving the nexty day at the residence of the Ven. Ananda Bodhi in Kinmount, Ontario. The Dharma Centre of Canada had requested that the Ven. Dat Pon Zon Aung Min Gaung Sayadaw Y Thila Wunta give meditation instruction and build a pagoda on their 400-acre meditation centre in Kinmount. 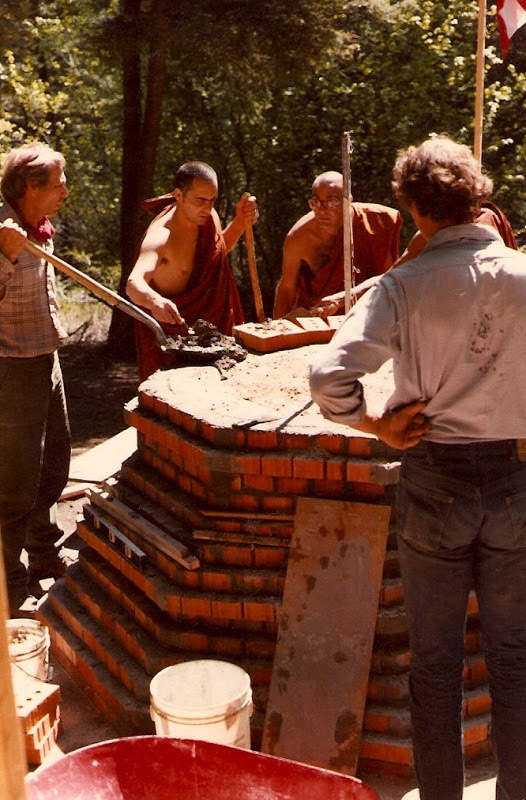 Construction of the pagoda began on the morning of the full moon, August 4, 1982. The precious relics were put in place a week later, and the structure was consecrated on August 22. It was the first pagoda built in Canada by the Ven. Sayadaw. For a month, the Ven. Sayadaw gave daily training in Pali changting of the Suttas of Protection and Blessing, and gave instruction and guidance on the meditation theme of Buddha Anusati to the many students. All beings present took the Five Precepts of Morality, many taking the Eight Precepts. One being took the Nine Precepts, which includes the training in the continual practice of sharing loving kindness with all sentient life. On August 27th, the Ven. Sayadaw, accompanied by 20 students, left Kinmount to renovate and enlarge the American Shwe Dagon Pagoda in Allegany, New York. Having only eight days to complete this work in a remote rural area, the Ven. 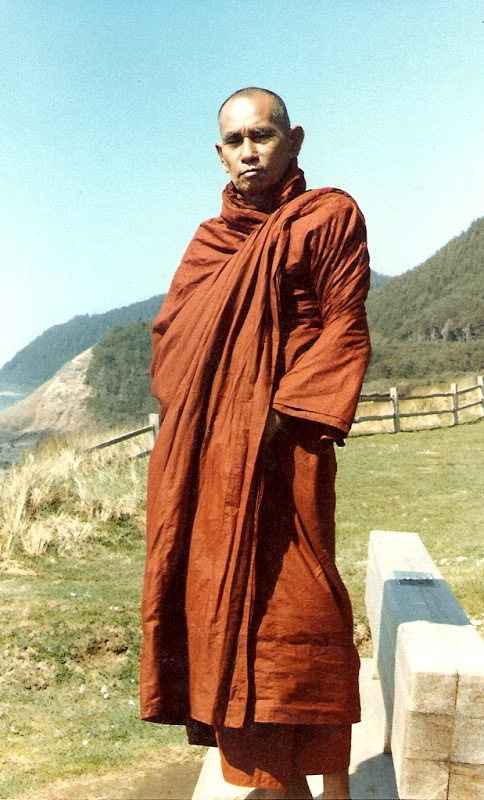 Sayadaw stayed in a mobile camping van lent to him by one of the Canadian students. The students camped out in the forest near the pagoda. On the morning of August 29th, the renovation began and within a week the pagoda was successfully enlarged from 10 to 21 feet. It was consecrated on the morning of September 6, 1982. One thousand dollars was donated by the Ven. Sayadaw for this meritorious action, and the remaining funds were donated by members of the Dharma Centre of Canada. May the merit be shared with all beings. On September 6, the Ven. 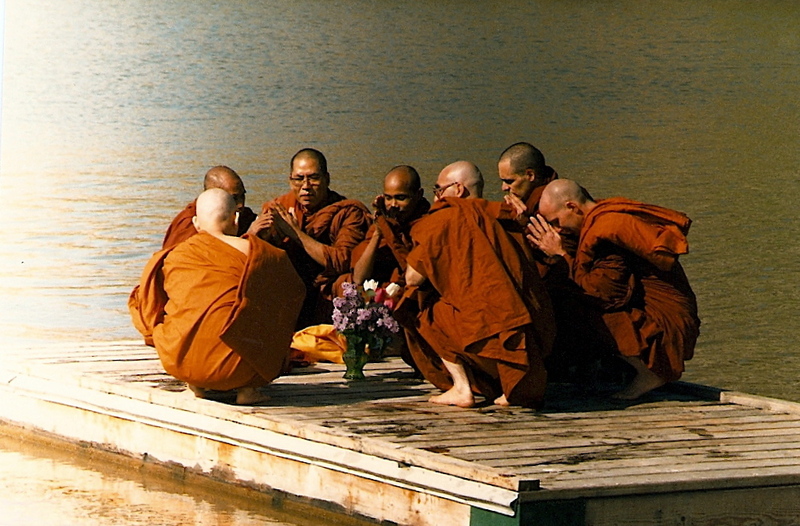 Sayadaw returned to Toronto, the next day flying the 3,000 miles to Vancouver. He continued on by ferry to Galiano Island that same night. At the Crystal Mountain Meditation Centre the building of a second Canadian pagoda was begun on September 9. It was consecrated on Saturday, September 18. During these 10 days, the Ven. Sayadaw continued giving instruction in Dhamma meditation with the sincere wish that all beings may be inspired to walk the Path. This was his last work in Canada, and on the 20th of September he left for Los Angeles. In California, the Ven. Sayadaw was again given generous support by Daw Toke and family, and the Ven. Sayadaw’s supporters, after hearing of the commitment and energy of the North American students, were deeply moved. On October 1st the Ven. 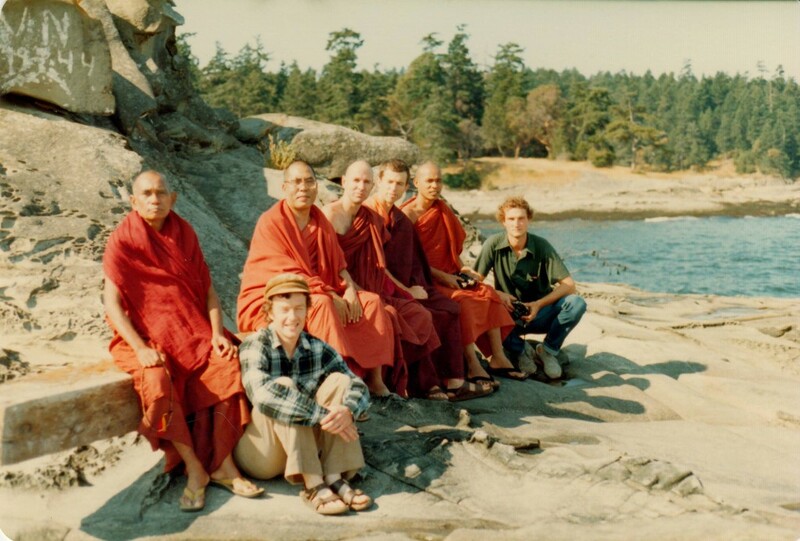 Sayadaw travelled six hours by car to the home of Mr. Russell Rolfe near Yosemite National Park in the Sierra Mountains to begin a 10-day meditation retreat. 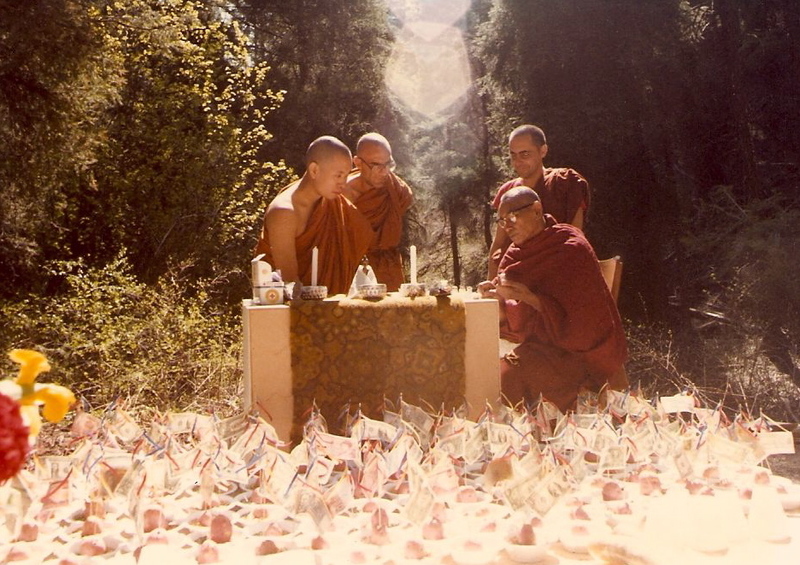 He made arrangements for 49 offerings of food and 49 offerings of water to be made to the Buddha, Dhamma, Sangha, Arahats, and Devas on each day of the retreat. [photo] Chanting of puja at Dharma Center of Canada, Kinmount, Ontario. This was done with the wish that through this practice all barriers to happiness be removed. [photo] Consecration Ceremony, Kinmount, Ontario. Supporters from the Los Angeles and San Francisco areas came and did intensive meditation practice on the Recollection of the Buddha. On October 11th, the Ven. Sayadaw went to San Francisco, staying two days at the home of Mr. Leon and four days with U Aung Myint. He flew back to Los Angeles on the 17th, resting from his travels at the home of Daw Toke. On November 13th, he left for a quiet week in Hawaii where he was well looked after by his Honolulu hosts. 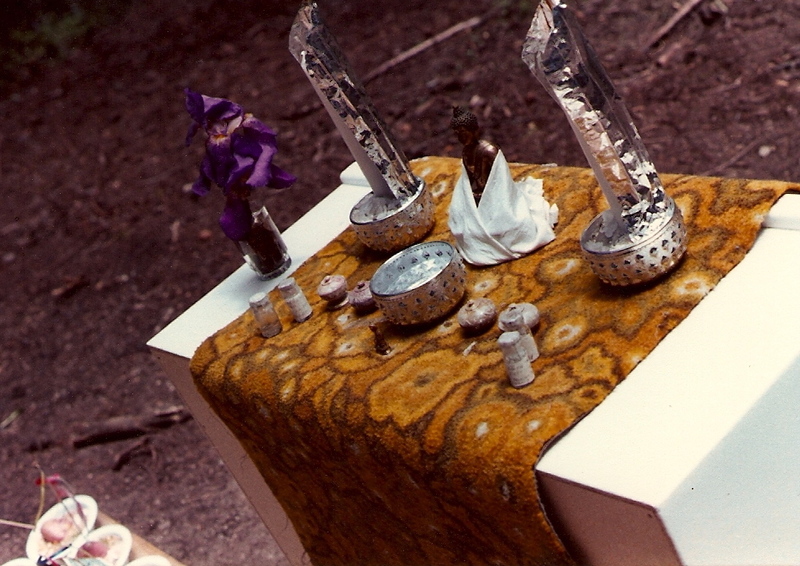 [photo] Consecration Cremony, Galiano Island, British Columbia. 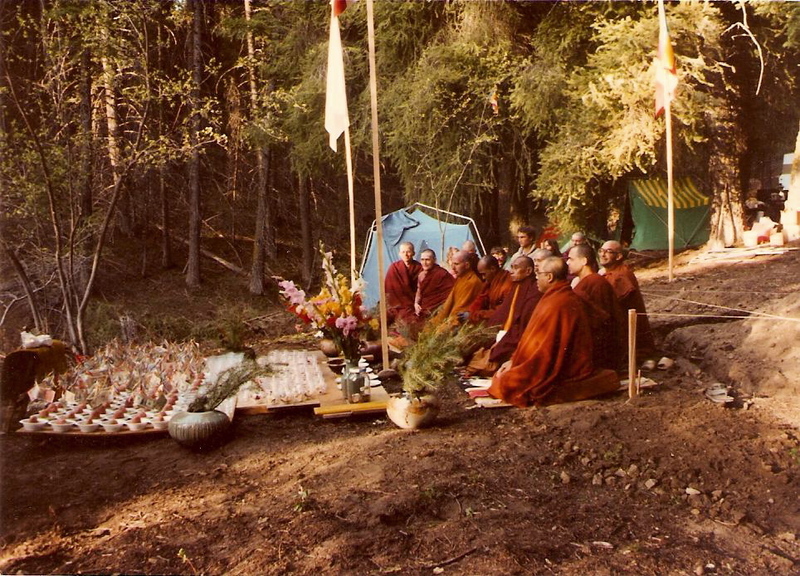 [photo] Special intensive puja and offering, Yosemite, California, 1982. [photo] Yogi O’Meara at forest retreat, Yosemite, California. [photo] Daw Toke at forest retreat, Yosemite, California. At the invitation of the Sphere Group of New Zealand – students of the Ven. Ananda Bodhi – the Ven. Sayadaw travelled next to New Zealand, arriving in Auckland on the morning of November 23rd. He spent two nights in the city giving instruction on Dhamma meditation, including Buddha Anusati from araham to bhagava. He then spent four days with beings near Tauranga, continuing his meditation instruction and the chanting of the Blessings of the Buddha. [photo] American Shwe Dagon Pagoda, 1982. The Ven. Sayadaw arrived in Wellington via Lake Taupo on November 30th. There he gave evening puja for the blessing and happiness of all beings, and encouraged all of the students to commit themselves to a daily practice of meditation. He took the Cook Strait Ferry on December 3rd to New Zealand’s South Island, and was driven the same day to the Sphere Group’s 144-acre Meditation Retreat Centre in the Wangapeka Valley near Nelson. After choosing the new pagoda site with members of the Sphere Group and giving instructions on necessary preparations, the Ven. Sayadaw continued on to Christchurch. There he gave evening puja and for three days made the 49 offerings of food and the 40 offerings of water for the Triple Gem, the Arahats, and the Devas. On December 14th he returned to the Centre at Wangapeka. 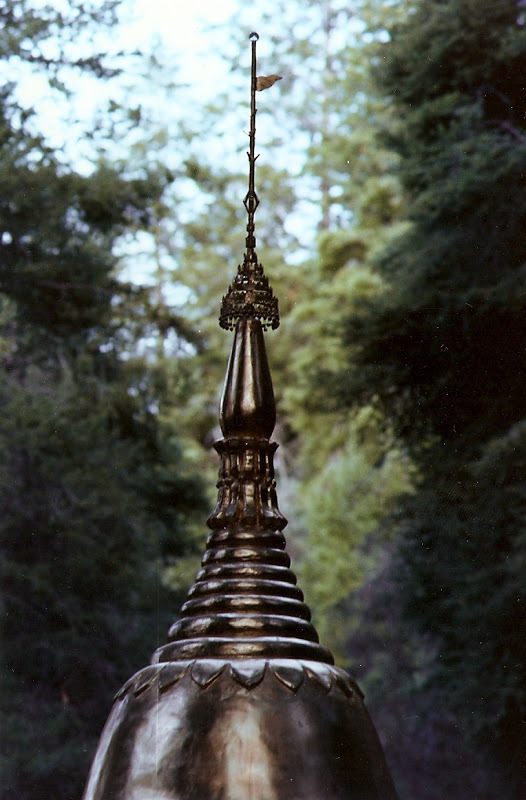 [photo] Crystal Mountain Pagoda, Galiano Island, British Columbia, 1982. [photo] Making of pagoda umbrella. 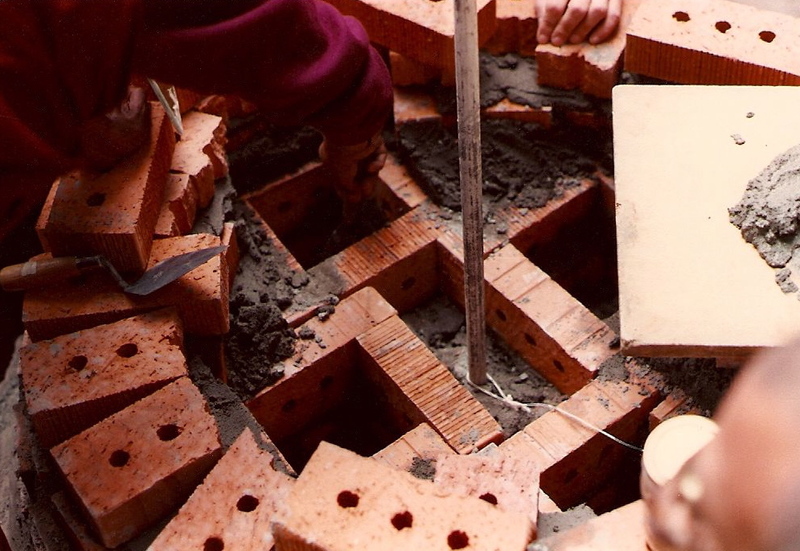 The foundation for the New Zealand Shwe Dagon Pagoda was begun on the Summer Solstice, December 22nd. Because of its location on a high mountain pass where the winds are often fierce, the foundation and all parts of this pagoda were strengthened with steel reinforcement rods. 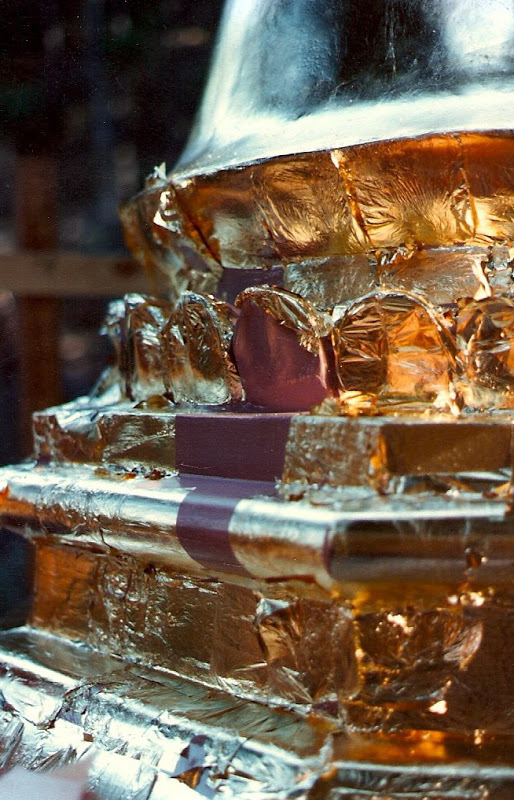 On January 2, 1983, the sacred relics of the Buddha, and the Arahats were placed in the pagoda and it was consecrated a week later on January 9th. It was built to a height of 19 feet. The Ven. Sayadaw returned to Wellington for three nights, staying at the home of Mr. Alan Smith, encouraging all persons to practice the Path of the Buddha for the happiness of oneself and others. En route to Auckland, the Ven. Sayadaw visited the large underground caves near Waitomo, before arriving back in New Zealand’s largest city. There he spent one week at the residence of Mr. David Pooch, chanting the suttas and continuing the practice of Buddha Anusati each evening. At the request of U Sai Hark and his wife, Daw Nunu Khin and other supporters of the Dhamma here in Auckland, the Ven. Dat Pon Zon Aung Min Gaung Sayadaw U Thila Wunta has agreed to share this short biography with others in the hopes it may inspire other beings to walk the Path of the Buddha. As of this writing, the Sayadaw plans to leave for Sydney, Australia on January 22nd. He will travel on ot o Canberra to discuss his efforts to firmly plant the Buddha Dhamma in the West with His Excellency Ambassador U Aung Than. He then flies to Adelaide, where he will be a guest of the Victory Centre. The members of this group, along with those of the Origins Centre in Perth, invited and made arrangements for the Ven. Sayadaw’s trip to Australia. The Ven. Sayadaw has been requested to construct a new pagoda, the Australian Shwe Dagon Pagoda, during his three-week stay in Adelaide. After the pagoda is completed, he will continue on to Perth to give teachings at the Origins Centre. Both the Victory Centre and the Origins Centre were founded by students of the Ven. Ananda Bodhi. After teaching in Australia the Ven. Dat Pon Zon Aung Min Gaung Sayadaw will fly back to Rangoon via Bangkok, thus completing his compassionate journey to the West. In the form of the six pagodas and pith instructions, the Ven. Sayadaw has left tangible statements of aspiration and awakening in six countries and two hemispheres. May he continue to be an inspiration to all beings. “Good? Keep. – No good? No Keep. Sit with an erect spine in a position that provides a base of firm stability. If the cross-legged positions are not suitable for you, sit in a straight-backed chair. 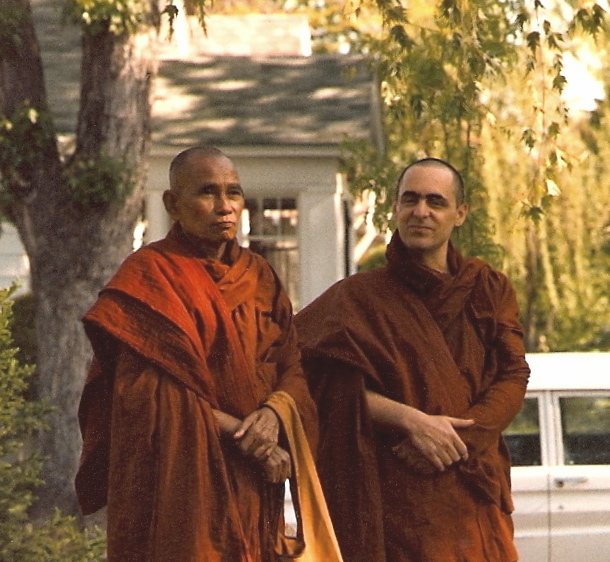 Acariya, the Teachers that have freely shared the Dhamma. Then a short statement may be made asking that any wrongs that have been committed through ignorance be forgiven. Close the eyes and have a sense of closing the five outer sense doors as well as the mind door. Silently intone the first attribute of the Buddha, araham. This Pali word means purification, the breaking of the wheel of becoming, and the closing of the gate to the lower realms. On the top of your head visualize a golden light, or perhaps a golden Buddha, while continuing to repeat silently Continue for a minimum of 10 rounds of the rosary. 108 rounds a day will establish a firm foundation for samadhi. Review the meditation using the four categories: body, feeling, mind texture, and phenomena of mind. Then dedicate the merit of the practice to the welfare and happiness of all beings. 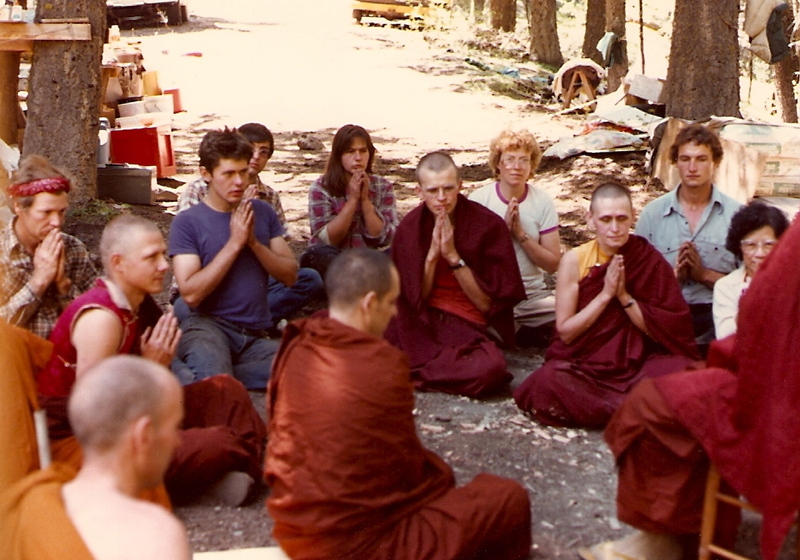 [photo] Dharma Centre of Canada Pagoda, Kinmount, Ontario, 1982. Many thanks to David Pooch for the hard copy of the text this came from; to Natalie Karneef for transcribing of the text; to Mira Riddiford who has driven this archiving project; to Vickie Ward for her photos of Galiano; to Open Path Boise for permission to use their photos. Why archive our history? To quote Martin Blackwell paraphrasing Goethe, “You can’t know where you’re going if you don’t know where you’ve been.” We honour the roots of our centre, and express gratitude for what we have been given.